There is absolutely no question that audiobooks keep up sane in the car, whether we’re traveling across town or across the country. We all have our own tastes, but everyone in our family likes a good story. The trick to finding the best audiobooks for road trips, is to look for stories with a good plot and an awesome narrator. This is no easy feat. We’ve fallen in love with all kinds of stories that were turned into humdrum audiobooks by boring, monotone narrators.Definitely not a great scenario when you’re trying to keep your eyes open on a marathon of a road trip. Since I first wrote this post, we have started using Audible for our road trip listening pleasure. For a monthly fee, you can download your favorite audiobooks to listen to anywhere. It’s awesome for road trips because you can bring a whole library with you. What makes it not so great for road trips is that you have a whole library with you. As with Netflix, I find the sheer number of audiobooks on Audible daunting. It’s so hard to choose! Well, that doesn’t stop us from using it, so if you’re willing to shell out a bit each month, the audiobooks you download are yours forever, even if you cancel your subscription. I still love popping in a CD when I’m driving because there’s no device to fiddle with, but the more time I spend on the road, the more I love using Audible. The audiobooks listed below are some of our very favorites, but keep in mind that we have boys who lean heavily toward fantasy and other-worldly adventures. The ages listed below. are a bit arbitrary, as books that are right for some might be too difficult or scary for others. For example, we started listening to the Harry Potter series when the kids were five or so, but after the third book, we put them on hold until the boys were a bit older. We know plenty of families that started their kids on these books as toddlers, and many others that introduced the books to their kids when they were in middle school. Use your best judgment. We try out new audiobooks on each and every road trip, so I will try and keep this list updated as we discover new favorites. These books are either read by a full cast of actors or incredible narrators — guaranteed to keep your kids off their devices and your driver from falling asleep! I am linking to the CDs for each audiobook on Amazon. If you use Audible or another service already, you can search for the books there. Rabbit Ears started publishing audiobooks on cassette in the 1980s. They featured popular fairytales and other classics for kids read by celebrities and set to original music. We love just about every story published by Rabbit Ears, and there are a lot to choose from, but this one is our favorite. I don’t know if it’s because we’re sentimental, but we’ve been listening to it since the boys were just toddlers. Our favorite is Rip Van Winkle, read by Anjelica Huston. The haunting fiddle music is a perfect fit — composed and played by Jay Ungar and Molly Mason. The other narrators on this disc include Garrison Keillor, Nicolas Cage, and Jonathan Winters. You should check out all the Rabbit Ears stuff, but if you can only get one, get this one! This could very well be another case of sentimental parents reminiscing about when their kids were little, but it doesn’t change the fact that we listened to these stories again and again when our kids were young, and I do believe it created a love for classical music that our boys would never have had if these stories hadn’t come into our lives. Disclaimer: our kids don’t voluntarily listen to classical music now that they are teens, but occasionally I catch them whistling a bit of music from these stories (still after all these years), and I can put on the classical radio station on Sunday mornings without a complaint. Okay, back to the stories. There are four in the series, each touching upon the life of a famous composer. The stories are riveting. There is a full cast of narrators, and it is all set to beautiful music. Our favorite, I think, is Vivaldi’s Ring of Mystery, but really we loved them all. In the boxed set, you will find the above title, plus Mr. Bach Comes to Call, Mozart’s Magic Fantasy, and Beethoven Lives Upstairs, which was made into a full-length movie. These stories may not be appropriate for the youngest listeners. They are a bit suspenseful, and combined with the awesome music that sets the tone perfectly, might be frightening for some. I notice that the Amazon reviews for this weren’t always positive, so you’ll have to make up your own mind, but we loved it. The stories included in this compilation are: The Fiddler and the Dancin’ Witch – composed and narrated by Wynton Marsalis, The Lesson of the Land – composed by Edgar Meyer and narrated by Graham Greene, and The Face in the Lake – composed by Patrick Doyle and narrated by Kate Winslet. Our favorite was the Fiddler and the Dancin’ Witch, about a young boy who longs to play his father’s fiddle but is always told not to touch it. The fiddle, it seems, has the ability to play whatever the person using it is thinking. The boy, Simeon, just can’t resist the allure of that magic fiddle, and he eventually disobeys his father. What he doesn’t realize is that the fiddle also has the ability to summon a dancing witch. Now Simeon is forced to match his wits and his music against the witch without his father finding out. The other two stories are fabulous as well, but all have a dark element, typical of fairytales and mythical stories from around the world. This is a classic story of an immigrant family and an immigrant cricket who meet in the subway station in Times Square. Chester Cricket accidentally hops a ride in a picnic basket, leaving his home in a Connecticut meadow and winding up in the big city. It’s there that he meets Tucker Mouse, Harry Cat, and Mario, the son of an Italian family who runs a newspaper stand in the station. When Mario realizes that Chester can make beautiful music with his back legs, he sets to work making the cricket famous. Chester and his new friends have all kinds of adventures in the city, but will Chester ever find his way back to his meadow in Connecticut? The Cricket in Times Square is certainly appropriate for all ages, but young children might not be able to follow the story for long. The narrator, Tony Shalhoub, has an awesome stage voice, and does a fabulous job narrating all of the characters in this charming story. The Cricket in Times Square is a 1961 Newbery Honor Book – a beautiful tale of getting lost and being found. The Chronicles of Narnia series by C.S. Lewis — This well-loved children’s story of magic, wardrobes, and talking animals is a timeless classic. We loved the unabridged, narrated editions and the full-cast productions by BBC Radio. Ella Enchanted by Gail Carson Levine and narrated by Eden Riegel – A botched spell leaves Ella in quite a predicament. Thanks to a incompetent fairy, she must follow every command that is given to her. The Dark is Rising series by Susan Cooper and narrated by Alex Jennings – Another series that includes modern children and ancient magic. I love how Susan Cooper entwines folktales, legends, and myths to create a compelling read. We were totally on the edge of our seats for all of them, but our favorite is The Dark is Rising (I think it’s book 2). Caddie Woodlawn by Carol Ryrie Brink and narrated by Roslyn Alexander – Caddie Woodlawn books are often compared to the Little House books. While we love them both, Caddie Woodlawn kept us laughing down the highway. She is fiery and inquisitive, and the books are a lighthearted way to learn about pioneer life. The Harry Potter series, books 1 – 3, by J.K. Rowling and narrated by Jim Dale — These are the books of my kids’ generation. As an adult, I fell in love with Harry Potter and the Sorcerer’s Stone as I read late into the night nursing a newborn back in 1999. We didn’t discover Jim Dale and the audiobooks until the kids were a bit older, and even now, I can hear Jim Dale’s voice floating on the breeze from the upstairs window of my teens’ bedroom. I’m not exaggerating when I say that we have listened to these stories hundreds of times. They are entwined intricately with the lives of my children, who aren’t really children anymore. The Boggart by Susan Cooper and narrated by David Rintoul – A delightful monster story? Seriously, this book is full of fun twists and turns about a ghost (boggart) who hitches a ride home with a family from his castle in Scotland. If you enjoy it, check out the sequel, The Boggart and the Monster. The Tale of Desperaux by Kate DiCamillo and narrated by Graeme Malcolm – Graeme Malcom’s voice is the first thing that drew us to The Tale of Desperaux, followed by an enthralling story, intriguing dialogue, and lovable characters. If you’ve seen the movie, but haven’t read or heard the book, you are definitely doing yourself a disservice. The story centers around a misfit of a mouse named Desperaux, his love for a princess named Pea, and a daring quest. It’s a magical story! Because of Winn Dixie by Kate DiCamillo and narrated by Cherry Jones – One we listened to The Tale of Desperaux, we starting devouring all of Kate DiCamillo’s books. We enjoyed most of them, but we particularly loved Because of Winn Dixie. This is DiCamillo’s first novel, and it was a 2001 Newbery Honor Book. The story follows 10-year-old Opal and her relationship with a scraggly dog named Winn Dixie. It’s a heartfelt story about love and loss, but never cheesy, as these books can sometimes be. And come on – sometimes we all need a good dog story! The Artemis Fowl Series by Eoin Colfer and narrated by Nathaniel Parker– I admit that this isn’t a book I would have chosen on my own, and it took some time for me to fall in love with it. It’s full of crazy adventures, all featuring a subversive teenage prodigy named Artemis, who find trouble with elves, fairies, and sprites, not to mention demons and goblins. There are fantastical worlds, villainous creatures, and a plot that keeps everyone guessing. I recommend this one for those late night drives when you just can’t seem to stay awake. Artemis Fowl is fast-paced, and it won’t take long for you to fall in love with the characters, both human and otherworldly. The Harry Potter Series, books 4-7, by J.K. Rowling and narrated by Jim Dale – I’ve included the second half of the Harry Potter Series here because they’ve got more mature themes than the first three books. They take on a more serious tone,and there is death, treachery, and a bit of cursing. We love them all the same, but recommend them for kids over the age of 10. His Dark Materials Series by Phillip Pullman and narrated by a full cast – I just finished listening to this (again) and can say without hesitation that you do not need kids in the car to enjoy this. Lyra, the protagonist, is an timeless and unique heroine – she is spunky, brave, innocent, and loving, and the story centers around epic adventures to save the world without realizing it. Over the course of her journey, she experiences betrayal, heartache, love, and deep friendship. She adventures with armored bears, a cowboy hot-air balloon pilot (my favorite character! ), a band of gypsies, a clan of witches, and a normal American boy who will steal your heart. This may just be my favorite young adult series of all time, and the audiobook is beyond fabulous, so please check it out! The Redwall Series by Brian Jacques and narrated by Brian Jacques and a full cast – Whoever thought we would fall in love with warrior rodents? There are a lot of books in this series, and all of them feature the beloved animals of Redwall Abbey. The dramatization is lively, with lots of singing and plenty of drama. It’s another good choice for late-night driving. The actors are skilled, the accents are decidedly British, and the characters are so much fun. These are our favorite audiobooks for family road trips, and yes, most of them are available on Audible. 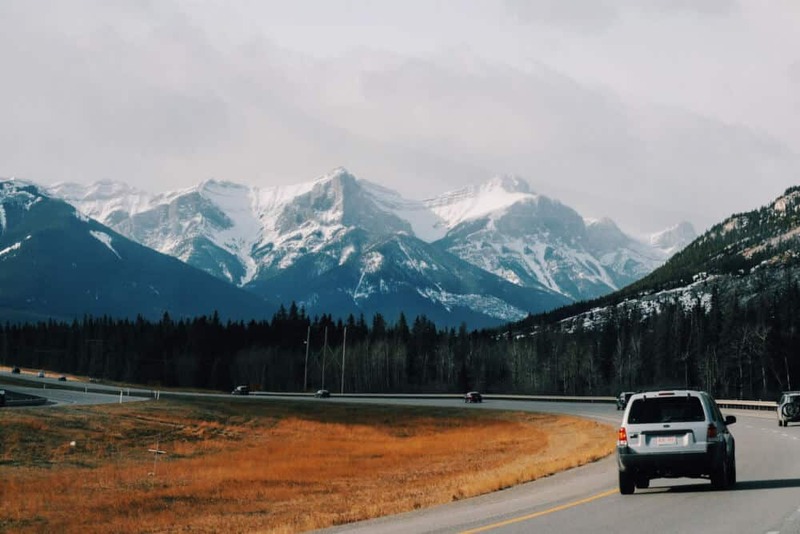 Do you have a favorite audiobook for road trips? I’d love to add some to our listening list. Love this post so much! I’m always listening to audiobooks in the car so it’s great to have some ideas. Thanks! Thank you, Kate! I am actually preparing for a road trip and realizing that I need some fresh ideas for adult listening. My next research project! I still have the Classical Kids collection on a CD in a drawer! Reading this brought back some great memories – we loved those stories! Also the Lightening Thief series. I know – every time I hear a piece of classical music from those stories, I get all nostalgic. I love the Lightning Thief books too, although, I haven’t listened to the audiobooks. That’s so cool, Deah. I’ve never heard of Audiobook Sync. I’m going to check it out now. If you can find it, we love “Have Spacesuit Will Travel”, by Robert Heinlein. Our library has the Full Cast Audio version (2004) by Will McAuliffe and the Full Cast Family. It is nice to have the different voices for different characters. It is the story of Kip, a senior in high school, who wins a spacesuit and then gets to go on adventures. It was written in 1958. Kip is working the soda fountain at the local pharmacy when he gets his spacesuit. It is probably best for the 6 and up set for following the story. This is one of Heinlein’s novels for juveniles so is appropriate for the family audience. What a marvelous idea! We have yet to try audio books and with this wonderful list it is very high on our list of things to do for our next road trip! We love to read and yet no one can read in the car without feeling a little carsick so we have done crafts and videos instead. LOVE this new idea to pass the time! What a wonderful idea. I have book piling up at home that I mean to read, but just can’t find the time. I totally have to look into audiobooks – totally forgot that was even an option. Thanks for the reminder. I love audiobooks! They’re great to listen to while traveling. It helps pass the time and you can enjoy some great literature without turning a page! I love love love audio books these days. They save me during long rush hour commutes daily! Fantastic idea for a trip! I’ve often thought they would be good if you are home sick or something too. I totally agree, Katy. I’ve always spent long hours in the car with my kids, so I have no idea what I would listen to for adult books. Any suggestions? I agree… I absolutely LOVE audiobooks! Audiobooks are a great option! We love to promote them at our library where I work. I absolutely love the Harry Potter audiobooks, they are so well done. I am obsessed with podcasts while driving! Yay! A post about books! Or audio books, but regardless one thousand percent better than video games! You have some really great books listed here. Thanks, Alisha. I had a million more swimming around in my head, but I didn’t want the post to be so long that everyone ran away.